Pregnant at 14, Miranda May went on to use drugs and compile a rap sheet. But the Salvation Army didn't give up on her. She's now 23, with two kids and on the road to recovery and a job. BREMERTON — She understands that some will not feel much sympathy. Bad decisions on top of bad decisions. Miranda May is 23, a recovering heroin addict with a long rap sheet. She has two children, ages 9 and nearly 2. She’s never held a full-time job. $25: two warm, safe nights at an emergency cold-weather shelter. $50: one month of heat for a family in danger of having utilities shut off. $100: a food box, which can feed two to three people for one week. $200: feeds six families of four for a week. May says her parents split up when she was 12. “They had long fights,” she remembers. After her three older brothers were out of the house, it was just May and her mother. May was likely suffering from depression, she now believes. At the age of 14, she learned from a drugstore-pregnancy test that she was pregnant. Downtown, there’s a bar called Monica’s Social Club, in a neighborhood that as seen better days. It was outside Monica’s that one of May’s encounters with police took place when she was arrested for investigation of felony possession of meth. Not far, on Sixth Street, is the Salvation Army building. It’s here that May is getting the help that has given her, and her children, hope. 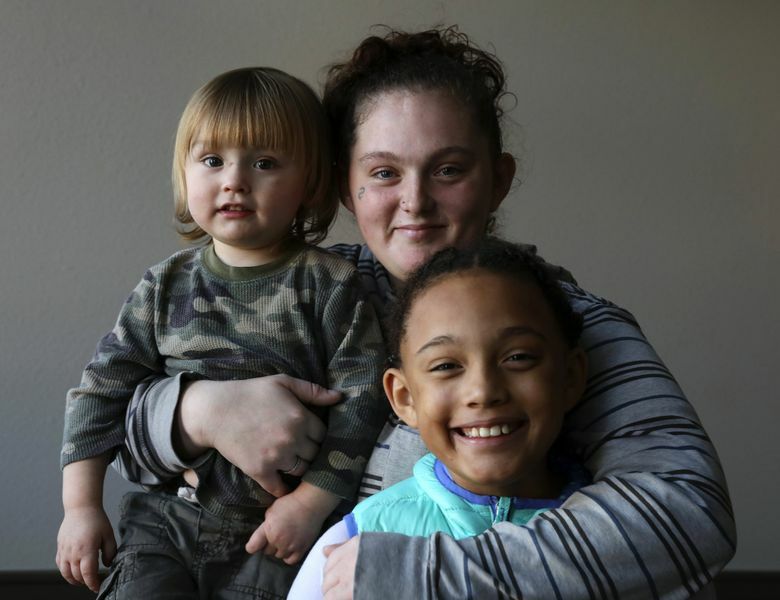 When May found herself at one of her lowest points — pregnant, homeless and in trouble with the law — it was the Salvation Army that offered a way out. What she found there were no judgments, says the Salvation Army’s Maj. Scott Ramsey, 57, who in his various careers also has been a correctional officer. 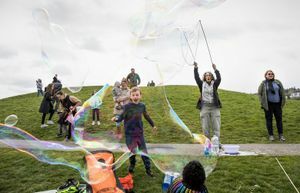 The Salvation Army is one of 12 charities supported by The Seattle Times Fund For The Needy campaign that, over the years, has raised millions of dollars from readers. 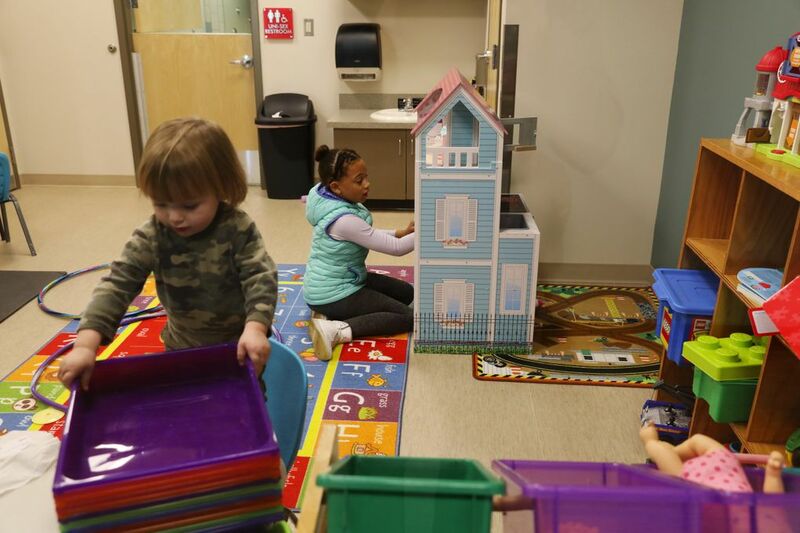 It was here, in the Bremerton building, when May was homeless and her mother was taking care of her first child, that she could sleep in the overnight shelter when the weather got cold. Last year, the shelter housed an average 69 people a night during the four months beginning in December. It was here, too, that May could get a meal. A breakfast could be a scramble of sausage, eggs, cheese and spinach, along with coffee and juice, and usually donated pastries. A lunch could be shepherd’s pie, fruit such as apples, bananas or oranges, a salad, and coffee and juice. Still, she managed to break rules. 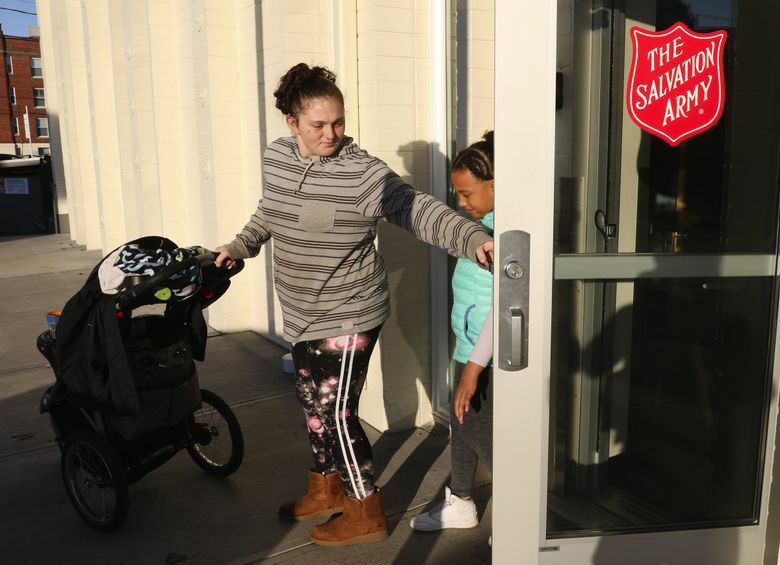 Looking out the window to the parking lot, the Salvation Army staff once saw her dealing drugs. “They kicked me out for a couple of weeks,” she says. Ramsey said he understands why some would not feel sympathy for May. Where was her personal responsibility? But there’s a difference, he said. May’s mom, Tammy Knauss, says she also can’t explain why things started going haywire in her daughter’s life. Arrested for possession of meth at age 21. Theft charges for stealing from JC Penney, Walmart and Safeway. Malicious mischief after getting into a family fight “with my brother and his baby’s mom.” Skipping court appearances. After giving birth to her daughter, now 9, it was May’s mom who took care of the toddler. “I was hanging out, running the streets,” she says. That’s when May was introduced to meth. “I’d use it once every other day, and every day. You get addicted to it,” she says. She then started using heroin. Getting drugs was easy. “You get it free when you’re a female,” she said. May didn’t have to sell her body. Guys, she says, will always give drugs for free to a woman. After the meth-possession charge, the deal with the court was $850, treatment and 100 hours of community service, and in turn, the charges would go away. She was assigned to the Salvation Army, in the hygiene center, cleaning the showers, doing laundry and giving out soap and shampoo. “She was a rock star,” says Ramsey about her work. During her community service, May found out she was again pregnant. That second pregnancy, says May, made her decide she had to stop drugs, and do something with her life. 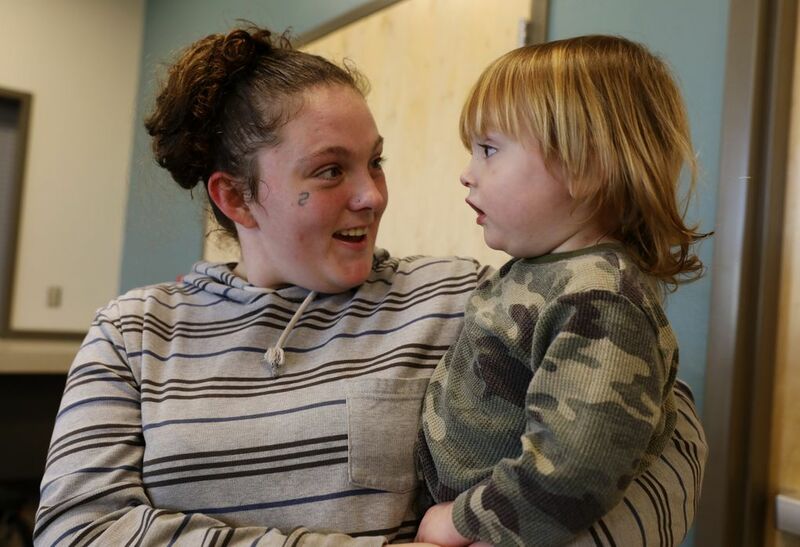 She quit, went into treatment and was on methadone during her pregnancy — and still is. The Salvation Army helped with the paperwork for the treatment, and provided an ORCA card so May could take the bus to a hospital. Her son, who’ll be 2 next month, had to be weaned off methadone when he was born, and May thinks she’ll be off it in a year. She’s going to parenting classes. She was, after all, a kid having a kid. Her daughter’s father sees the girl every other weekend. May says he pays $90-a-month child support, which is what was determined by the state based on his fast-food job. May is studying for a high-school degree at Olympic College. “I’m going to try and get a decent job. I’ve never worked before,” she says. At the Salvation Army, Ramsey told her to stop by and fill out the paperwork to work part time at the shelter. After a few days, May hadn’t yet stopped by for the paperwork. “I’ll have to encourage her,” says Ramsey. A few days later, May came in, saying she didn’t know how to fill out a job application. The Salvation Army helped her and she got the job.